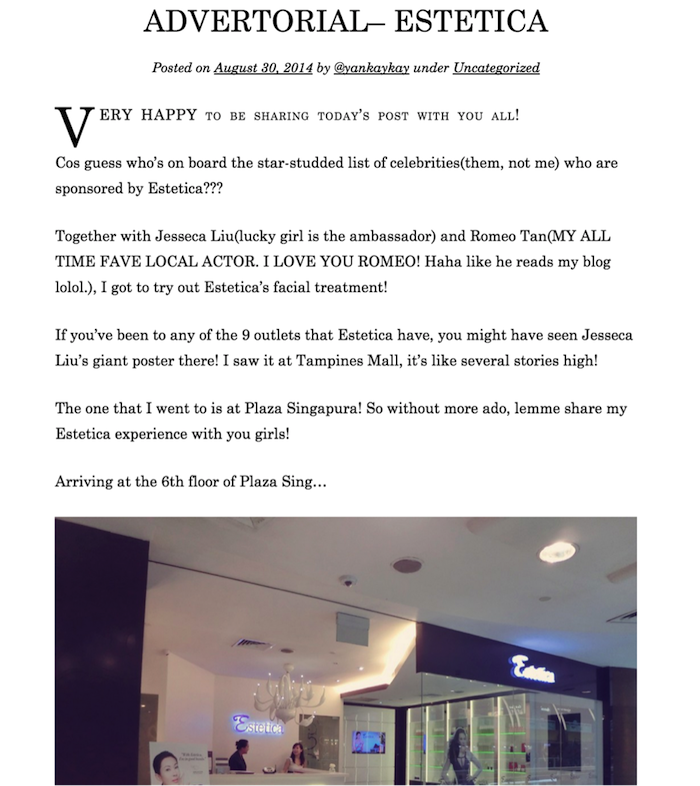 Yesterday, we wrote about Xiaxue’s post calling competitor social media marketing firm Gushcloud out for allegedly unethical marketing practices. Among the things she accused Gushcloud of are inflating its earnings to media, inflating bloggers statistics, faking the number of YouTube statistics, manipulating financial reports and masking paid ads as genuine reviews. Earlier today, Gushcloud co-founder, Althea Lim published her response to this with a personal statement. For Vincent and the Gushcloud team, here’s the official response to the various allegations. Some of you maybe wondering why we took more than a day to prepare this as a day on social media feels practically like a lifetime. But it’s important to get things right. We spent the last 36 hours speaking with our investors, clients in the region, influencers and lawyers about this matter to assure and clarify the matter with them and to seek their permission to use and make certain data public. As you can imagine, there are a lot of things my team and I had to do through this holiday season, on top of making sure existing clients’ campaigns are running well and of course not forgetting, talking to reporters, well-wishers and supporters. In the last quarter of 2012, Gushcloud was undergoing a big change in our business model. Our initial technology platform, GushAd.com, was performing poorly and we ventured into influencer marketing services. We worked really hard at this new venture and (thankfully) almost half of our revenue in 2012 was made in the last 3 months of 2012. That was a very exciting, yet trying time for us. You can imagine how the feeling of escape the near-death of a company and to see your efforts start to pay off. I was personally in the US making arrangements to shut our business operations down around the relevant point in time and to look at turning it into product development office. In the midst of the turnaround, one of our employees spoke to the media about our earnings and this was mistakenly construed to be S$170k monthly. This was an honest mistake. With the benefit of hindsight, I should have come out and issued a clarification (I was not aware of the mistake then). Believe it or not, the November 2012 article hangs on our timeline wall but that part that states the monthly revenue is cut off at the bottom. Let me state the fact – Gushcloud does not force our influencers to mask ads or hide or pretend that they are not paid. The allegation is entirely supported by an e-mail from 2011 stating that posts should not be “like an advertisement” as well as stunt with a fake company. We stand by our comments. 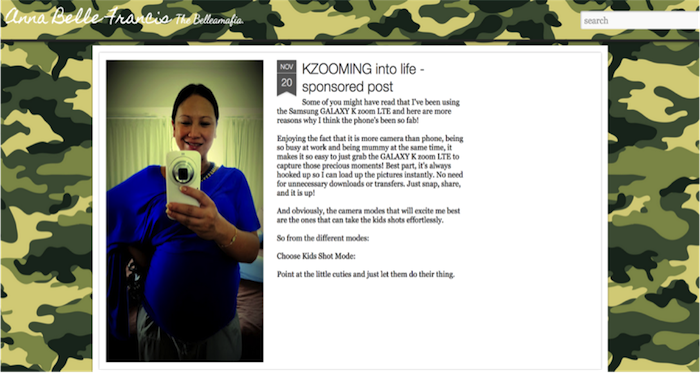 Blogs and posts should not read like advertisements – advertisements are not fun to read and are not the most effective. No where in our influencers’ contracts does it state that influencers have to do so. i) Gushcloud doesn’t dictate the disclosure requirements to our influencers because the law does not require it in Singapore. 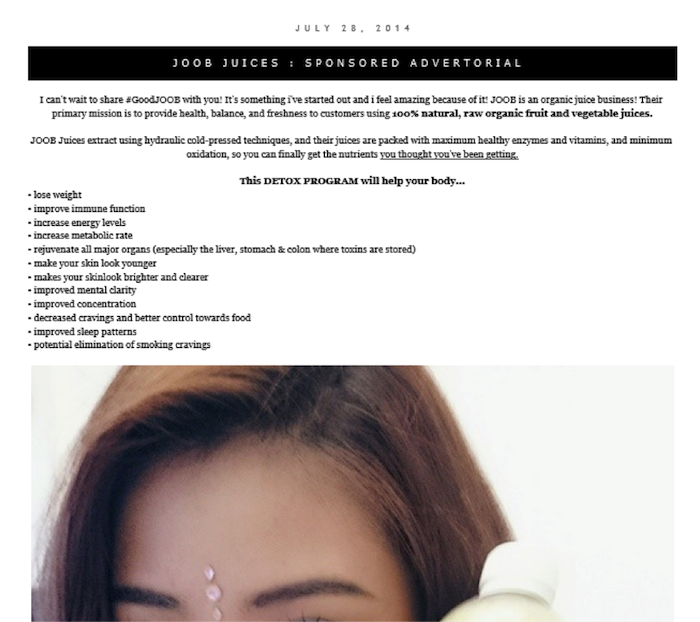 If an influencer typically puts a disclosure in their Ad saying “Sponsored Post” or “Advertorial,” we don’t change that about them, nor do we ‘force’ them contractually to remove all mention of ads. ii) Wendy said that Gushcloud asks its influencers to mask ads and alluded to the idea that we enforce this in our contracts with the influencers. This is not true. We let the influencers we work with write it in their own style. iii) What do we ask our influencers to do? – We give them content guidelines such as “don’t write it like an advertisement”. No one likes reading advertisements for fun and we do not think that’s the most effective. What about client’s requests? And Wendy’s fake company? When we receive requests from clients in Singapore to have the post not mentioned it’s an Ad, we check if the influencers are comfortable with it first. If they are, we share with them the client’s preference between our intention is to offer the best service to our clients … What we do is lawful. The law does not require disclosures right now and this framework allows our bloggers to have the flexibility to write in their way which they are comfortable with. iv) Will we consider implementing mandatory disclosures on all sponsored content? – Yes this is a possibility. The industry is evolving and we are a part of it. 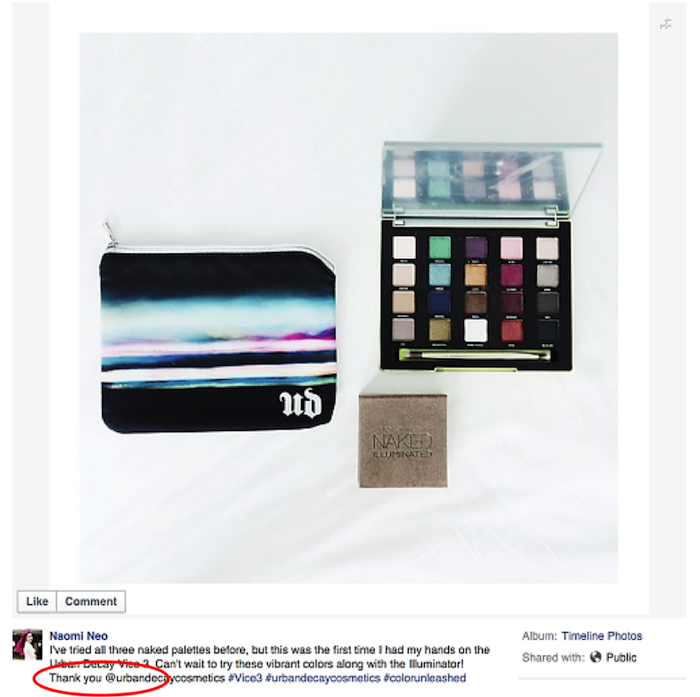 – Since the industry is evolving, other agencies and bloggers are afforded the same flexibility on whether to label explicitly if a post is an advertorial/ sponsored post/paid ad. Here are some examples and there are nothing wrong with these posts. 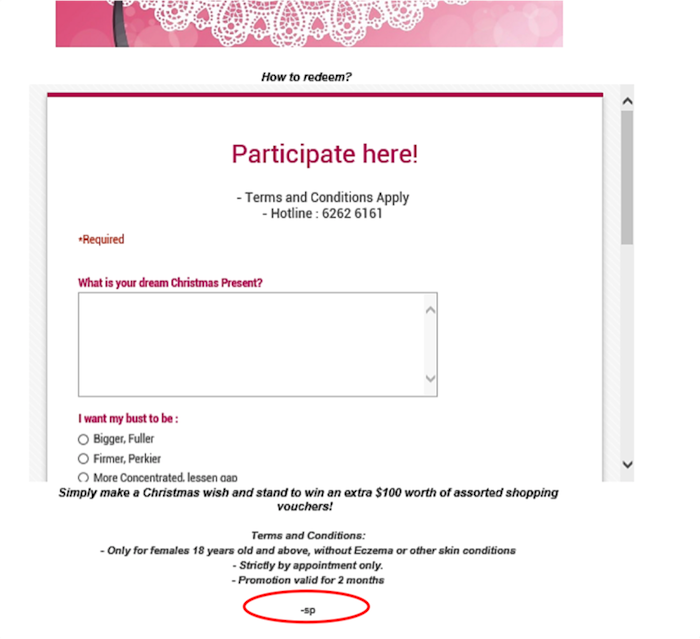 In short, does Gushcloud as a company force our bloggers to mask ads? The answer is clearly no. Do our bloggers then take it upon themselves to do so? We are sure some do, a lot don’t. As long as people act within the law and behave in a responsible and accountable manner. We are happy to live and let live. The allegation (and insinuation) that we do it as a standard corporate practice is false. i) Gushcloud shares monthly page views for each influencer profile we recommend to clients via a Power Point presentation deck. This is usually done as an approximate number or given number range and we update our decks manually every few months (sometime annually) or when an influencer’s numbers changes significantly or that we are alerted to. ii) The reason why it’s done manually is because we have not implemented technology to automate the collection of page views and other statistics from our network of influencers. This is coming soon. Stay tuned. iii) Because the process is done manually, various decks sent by different account managers at different times will show different numbers. This is something we hope to solve through technology. But here are 3 examples of the deck we showed our clients in October 2013 and the deck we show our clients in 2014 and the corresponding influencers’ statistics based on Google Analytics which the influencers have kindly given us access to . The numbers are rounded to the 10,000s or 5,000s for easy reference and we always state that it is an approximate figure or we provide a range. 2. What Google Analytics tells us about her numbers in 2013. 8. What Google Analytics tells us about her numbers in 2014.
iv) Based on the examples above, Wendy’s allegation that we inflate our influencer statistics by 5 times or more is false. There are 3rd party tools out there that can track website statistics fairly easily and with some level of accuracy. It does not serve our interests to inflate. v) What about the tracking link? 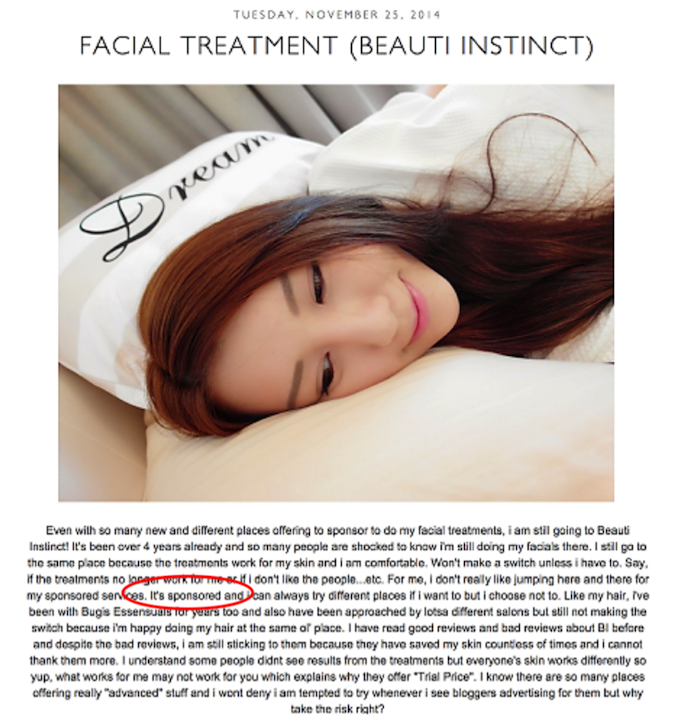 – The tracking link Wendy put on our influencer’s blog does not show the accurate numbers. There are many technical reasons for this. But between the influencer’s own Google Analytics and her tracking link (which uses an aspect of Google Analytics), we defer to the numbers from Google. vi) Are clients satisfied with our services? No, because we haven’t been able to service small businesses or particular industries as well as others. Timeliness of response, lack of reach to certain target audiences and pricing are feedback that we have been given. Yes, because we have done many annual reviews with many of clients who have told us that they are happy with our services but have given us pointers on where we can improve including the need for better tracking and measurement of campaigns success. We agree. We are working on better tools for this. Did we grossly inflate our Influencers’ views? No. The numbers and graphs speak for themselves. But this incident has further validated a need for us to implement technology to keep our numbers updated. i) My co-founder Althea has already shared in her blog post how this point is simply false. ii) We do not appreciate that Wendy insinuated that we bought views. Creating good video content that audiences appreciate is a talent that we respect YouTubers for. We put in a lot of effort together with Kay Kay to create content that her audience wants. This screenshot of the YouTube Analytics of the YouTube Channel YanKayKay shows where the traffic for her videos came from. Much of the video views come from YouTube’s recommendation engine and it does so by showing recommended videos it thinks you would like on the side bar, after the video and on the localised home pages of YouTube. The allegation (or suggestion) that we bought YouTube video views in order to build a channel for ourselves to earn advertiser’s money is false. Where Instagram drops a bomb shell once in a long while by removing millions of followers, YouTube removes fake video views regularly because they are firmly against ‘view count gaming’ and they prefer legitimate means such as buying ads on YouTube or great interesting content. In summary, we don’t buy YouTube views. We are here for the long-term and our reputation is precious to us. Of all of Wendy’s allegations, this is perhaps the most damaging to Gushcloud. By making the insinuation that we are unable to pay our influencers and vendors and that we are financially unsound, we run the risk of losing our influencers and partners. Our investors and shareholders may lose faith in us. The ramifications are serious for Gushcloud. I do not want the fruits of our hard work, passion and effort poured into Gushcloud for the past 3 years to be tainted with Wendy’s false insinuations as it appears to be happening. i) Missing documentation on operating expenses and supporting documentation suggests that Gushcloud is engaging in some shady business. ii) Our balance sheet suggests that we will have trouble paying vendors and influencers. She then uses these ideas to attempt to create a loss of confidence in the company, directed at our influencers and perhaps our investors. After discussing with the Auditors and informing our investors of the discrepancies, we told the auditors we agreed with a qualified opinion in our year and a half of operations. B) $150,252 was paid to Gush Ad users in 2012. Auditors want to check that every single cent that was paid out was linked to a particular shared Facebook Post or Tweet created by a user. Because our system did not save the Facebook posts and tweets and specific links, we weren’t able to prove to the auditor’s satisfaction that the users did the tasks that earned the money. That said, we were able to prove without a doubt that we performed the payouts to users because the bank transactions corresponded to the user requests for withdrawals. ii) Can we pay our influencers and vendors? The longer answer is that a company’s balance sheet shows a snapshot picture of the company at a single point in time. On the day the balance sheet was prepared and tested, the balance may be $16,215. That could have been the day we paid our salaries, who knows, money comes into a business money goes out. A younger service-based company usually has a lower cash balance because it is growing and needs to pay out just as fast (if not faster) than it collects money. While it does take tremendous effort to maintain cash-flow and chase fellow industry players to pay on-time, we have managed and we have deliver on our contractual obligations. We have been making regular payments to influencers for the last year and a half. Have we had issues with delays in payments to influencers? Certainly. Our influencers have given us the feedback that our policy to pay only after our clients have paid us is not favourable to them. In order to address their concerns and to provide a better service to our influencers, we raised financing and took on normal business loans in order to make payments to our sign influencers in 60 days or less after completion the campaigns. We have made many improvements in our payments system but we can also improve further. Entrepreneurs need to manage growth, cash-flow, profitability and many other factors in business. We are accountable to all our stakeholders including investors, shareholders, our team and our influencers and we keep them updated about the state of our business. The fact of the matter is 2011 and 2012 were tough years, we had many bumps and we nearly failed. 2013 was better but we were still learning our way. In 2014, things have improved but yet we have to face new challenges as a bigger company. 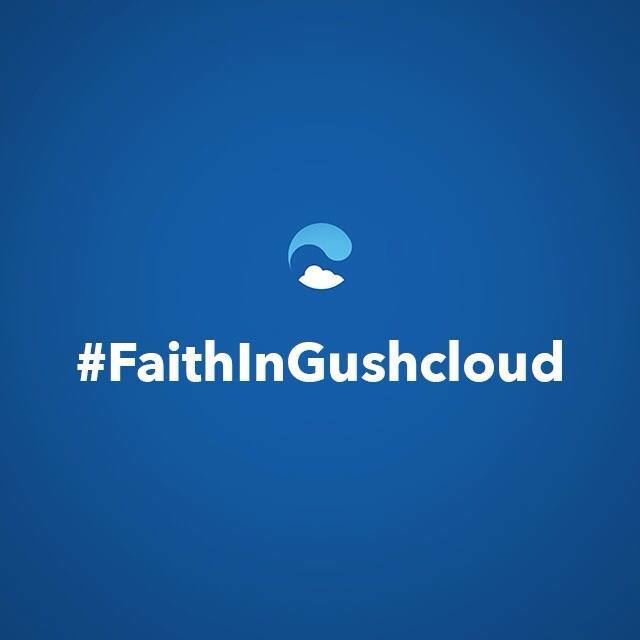 I have every confidence that Gushcloud will keep growing, learning and improving because we have good teams. 2014’s books will come out next year. The business is growing and we had to raise financing to fuel the growth. At the beginning and at the end of Wendy’s blog post, she said many things about my character and about my colleagues and the company. That is her opinion. Since the incident happen, Gushcloud has been keeping its investors, partners, clients and influencers updated about what happened and what we are doing about it. We are thankful for many of you who have contacted us with your support and advice on this matter. It is the Christmas and holiday season and what ever this fray may be, we hope people will spend more time with their family and loved ones in remembering what this season is about. On a personal note: I’m not yet a father, but I hope to be one soon. My team at Gushcloud is like my family and when others attack us, it hurts. What I do not appreciate is Wendy calling me and my team dishonest and saying the business is in trouble. These allegations are not true. If there’s anything to be guilty of, its that I’m human to a fault. I make mistakes like losing records, glancing over reports, not communicating often enough and perhaps doing the SMU jump awkwardly. But the truth is that Wendy owns a stake in our competitor’s company. Wendy is human too and she has her own opinions. There are many areas in which we can agree to disagree on because this is the nature of competition. But let’s look at ways in which we compete on providing the best service to our influencers and our clients instead of dragging each other through mud. Live and let live. Love and then love somemore. Merry Christmas to all reading this. Please have a pleasant holiday. Disclosure: Gushcloud is a shareholder of Vulcan Post. This article is produced independently by the Vulcan Post editorial team.